Perhaps you’ve heard someone refer to a startup and say, “that sounds like a feature, not a company.” Assuming the business has a solid premise, (i.e. uniquely solving a critical problem in a large addressable market,) this comment is usually heard because the entrepreneur lacks the big picture. They haven’t looked all the way up what I call “The Value Creation Ladder” as they conceive and build their business. 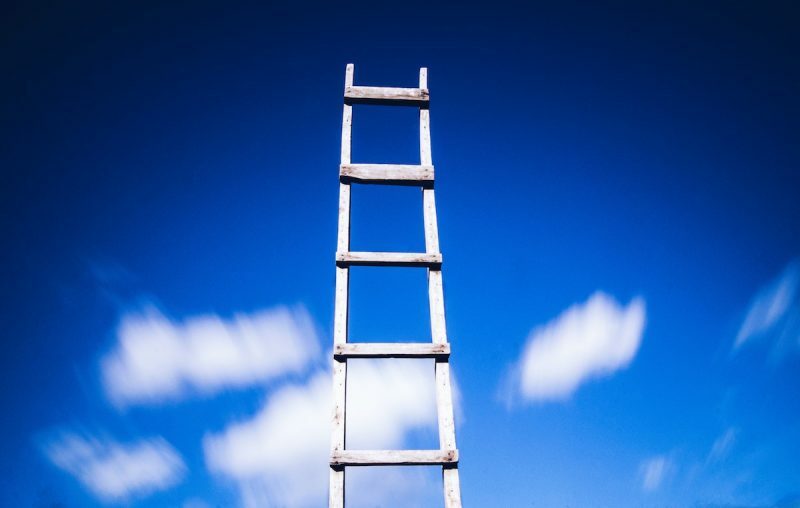 The Value Creation Ladder is a planning methodology to help startup entrepreneurs create a roadmap through which their business can grow to significant scale. Like a foundation on which you build, each rung supports those above it. This is a tool to help entrepreneurs think ahead, so the decisions they make today support the business needs of tomorrow. Make your own using this template. Write a couple sentences for each “rung” that defines the value you create in each area. Then, by maximizing the value you put into – and extract from each, you will enhance the value of your business. Customers with Money – A profitable business needs customers with money to spend. Customers you can track down and ones that are used to spending money to receive value. And of course, the more the merrier. Founder – The source of the vision and the one who defines an organization able to execute on that vision in order to meet a sizable market need. Team – With solid rungs beneath this one, the type of people your business needs becomes clear. As the team grows, the qualifications will evolve but the foundational traits and characteristics (which define the culture) should stay the same. Differentiation – Any large, successful business stands clearly apart from – and is obviously superior to – their competition in the minds of their customers. Product Family – Start by carefully choosing a point of entry from which to expand to serve more of the business ecosystem. You need a plan to enhance existing products and also to release complementary products while responding to evolving customers and markets. If customers don’t buy, re-invent until they do. Intellectual Property – As a business grows, both trademarks and patents become increasingly important – you need both. Good trademarks prominently anchor the business in the customers mind and good patents protect key functional aspects of your products and pave the way for significant partnerships. Scalability – Businesses can hit a ceiling for many reasons and some never break through. The reasons might be technical, operational or managerial – or it might be due to market conditions, pricing or competitive pressures. Or maybe there aren’t enough customers that want what you’ve got. In any case, if you can’t break through, you’ve hit your limit. If you don’t think this through from the start and have a plan to break through and achieve meaningful scale, you’re not going to build a big business. Profitability – It’s a simple concept; make more than you spend. You’re better off if profitability grows as the business grows so find economies of scale and build complementary products that share infrastructure. Expansion – You may start to saturate your original market and further growth requires business expansion. The solution depends on the business but you should have a plan to expand to other geographies, enter related verticals or acquire complementary businesses. Modify these steps to suit your own needs. Just make sure the rungs complement each other and fit into a unified whole. Use your Value Creation Ladder to guide your decisions and update it as you grow to keep it relevant.